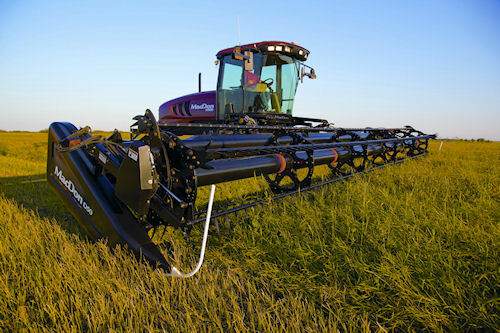 The M105 and M155 share many features and brings to three the models in the M5 Series windrower. MacDon has added a host of features and more power to its line of self-propelled windrowers, and just completed its M5 Series line up with the introduction of the M105 and M155 models. The two new models join the M205 with more speed, more comfort and more overall performance than many competitive models, say MacDon officials. Tier III Cummins diesel engines that sport a power bulge for extreme conditions. Increased fuel economy with an Intermediate Speed Control that allows header functions to operate at full speed with reduced engine RPM. The recently-released M105 MacDon self-propelled windrower, shown, and the M155, complete the company's M5 Series lineup with the previously released M205. Improved operator visibility and comfort with a cab-forward design that includes curved windows and an adjustable air-ride seat, along with finger-tip controls for the header. Easy maintenance design with moveable rail platforms and cooling system cores that slide or swing out of the way easily for fast cleaning. A redesigned chassis and wide wheel stance for more well-formed windrows. For more information on the machines, visit www.macdon.com, or call (816) 891-7313.